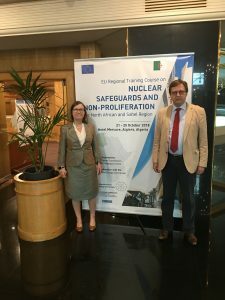 Caroline Jorant and Luc Van Den Durpel lectured on physical protection & security and on nuclear fuel cycle & non-proliferation aspects for a selection of 40 experts from North African and Sahel countries. ESARDA organised the first of these workshops in North Africa and the Sahel Region in Algiers during October 20-25th 2018. Nuclear-21 has already contributed for several years to ESARDA training courses and we will continue to do so as part of our commitment to further the development and deployment of safe, secure, competitive and proliferation resistant nuclear energy systems worldwide. Nuclear-21’s experts are available to provide lectures and training on nuclear fuel cycle developments, non-proliferation and many other topics related to nuclear energy and medicine. You can contact us if you wish to engage our services.